why not forking the Plex addon? It's easy to theme the existing addon (if the license allows it). nullpointer has outlined how the EmbyCon addon can be skinned. And this plugin is genius. Never saw such a Kodi addon since years. We already have the working code base of EmbyCon. All what is missing, is the frontend part as a sperated GUI. No, the official plex kodi addon was built by them from scratch, they hired a couple of kodi devs to create it. EmbyCon cannot be skinned. It just uses the windows of the activated skin. nullpointer outlined how it can be integrated into the home screen by modding the Estuary main skin of Kodi. The addon has no own skin parts. And that's what I can do with my skin. For example: Integrate the option to activate a "EmbyCon" mode, which replaces all widgets and lists with the EmbyCon sources. But that means that the local database would be ignored. Edited by sualfred, 12 August 2017 - 02:09 PM. Really? I thought they copied Emby's. With the utmost respect to your work on the Emby Theater clients, Kodi is a beast (flexible, fast, etc, best PVR integration, etc.). I use Emby Theater and the WebGui on my PC, XBone, Android. But on my HTPC, my daily driver? Nope. But we are going OT. Edited by sualfred, 12 August 2017 - 02:34 PM. It has been back and forth. We ripped PleXBMC for xmb3c, Plex ripped Emby for Kodi for PlexKodiConnect. 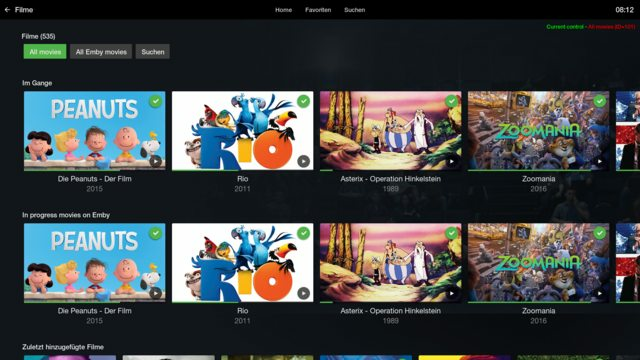 Now Plex has a new addon called Plex for Kodi. Yeah, we could copy that, but it is more like a separate app launched from Kodi. I think a skin that 'knows' about EmbyCon but also about native addons is a better direction. But my days of coding for this are over - for now at least. We can work on adding dynamic content end points for any info you need. Based on conditional visiblity (Library.HasContent(%s) and System.HasAddon(embycon)) I could show only the DB, only EmbyCon or both together. Sadly the Globalsearch script won't work with EmbyCon. Edited by sualfred, 13 August 2017 - 02:18 AM. Feel free to ignore but I feel this way will cause a load of pain in keeping it in sync with both the native kodi database and the embycon addon. I’ve been there before back in the xbmc3 days. A combination of embycon with skinned windows in the addon (ie like plex for kodi) would be optimal as you control the whole process. If you two could combine it would be awesome, maybe null pointer could do the python and sulafred the skinning. I'm with im85288. I would prefer something similar to the official Plex addon. That's cleaner and more user friendly. I have no problem to take care of the skinning part. But if we are going to achieve something like this, we should switch to something like Slack to discuss the details. Let me complete the skin for the common Kodi interface. It's still a long road. As soon as I'm done we can discuss the missing options of EmbyCon. We would def. need some python scripts to get the cast lists etc (like Marcel's skin.helper.service/.widgets). Edited by sualfred, 13 August 2017 - 04:48 AM. that skin looks amazing!!! Why no posting in the Kodi WIP-section? I am also using Emby for my mobile devices and Kodi for my media players (Shield TV boxes). Therefore I would love to have some kind of unified interface. However, are you already skinning for Kodi 18 "Leia" or still for Kodi 17 "Krypton"? Though Leia is already running very stable and offers some great advantages, especially for Android users (like Google voice-search and inputstream-plugin) there currently is not much skins available yet. Everybody still is skinning for Krypton. Can't wait for a release. Keep up the good work! It's still on Krypton because Leia is too buggy atm. And the Emby addon has no support yet. Edited by sualfred, 14 August 2017 - 04:45 AM. OMG, you cant use includes with addon skins! Nope. You sure can't and to top it off, you can't control the font either. The Python guys are crying for addon fonts and includes for years. Dunno why this isn't implemented yet. The only way is to add the addon skin files into the active skin directory. And they would never allow an official add-on to do anything like that. Yeah, the official repo rules... That's another reason why I use my own and the Kodinerds repo.